Follow along step-by-step with Amy Finlay and learn how to knit mittens. Includes Amy Finlay's Classic Mittens in All Sizes pattern, as well as a 30 minute video. And there's no waiting for shipping: the video and pattern are provided to you in an email after you complete your purchase. Mittens are one of the most fun and satisfying projects for knitters of all skill levels, even beginner level. Don't be intimidated by the multiple needles--you only have to hold two of them at a time! In this video I show you how to make a mitten, from start to finish. 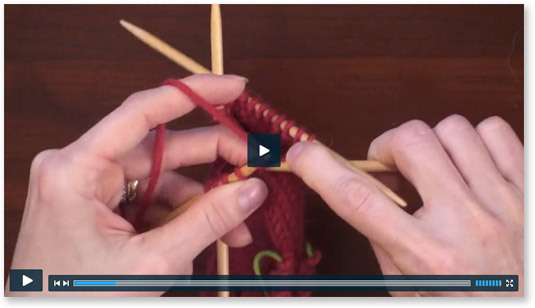 Video covers: casting on to and using double pointed needles, knitting a ribbed cuff, creating the thumb gusset, the hand, and the thumb itself, and weaving in the ends. I haven't had a chance to review the pattern yet, but I was disappointed with the presenter of the video. She used the word "um" too many times and the presentation didn't flow. I also found the clanking of the dpn's on the table distracting. I would not recommend this video. Thanks. and got me through the tricky parts. This was my first attempt at a thumb gusset and the video was a big help. The mittens were a gift amd they fit perfectly and are some of the warmest the person has worn. Amy has tught me socks, and now mittens. I can't wait for the next video, Keep them coming! I made mittens!!! They have holes and are not the prettiest mittens in the world, but when I came across this website I didnt even know how to cast on! Thanks for the simple instructions and encouragement, this was worth every penny to give me the confidence to create something! Click the button below to add the Premium Video: Classic Mittens in All Sizes to your wish list.